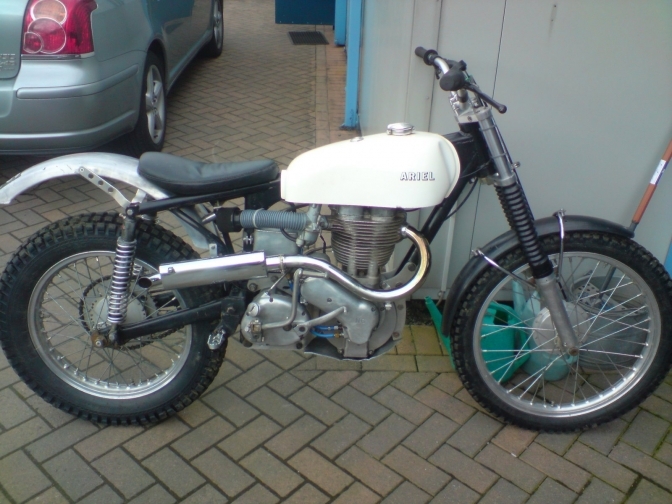 Time to blow the dust and cobwebs off of that abandoned Classic Trials Bike project and bring it into life. 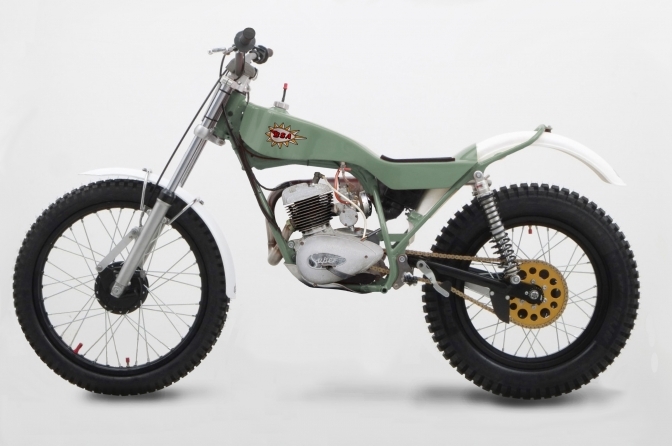 Is a new page for those Classic Trials Bike projects that have been left abandoned, for years just gathering dust. Find it back out, I know that I have more than most. The old phrase you started so you finish springs to mind. You get it back out and you will be amazed at what you have already done? And this may spur you on to finish the project this time. You know you always wanted to ride the bike and I can guarantee the first start-up will put a broad grin on to your face. 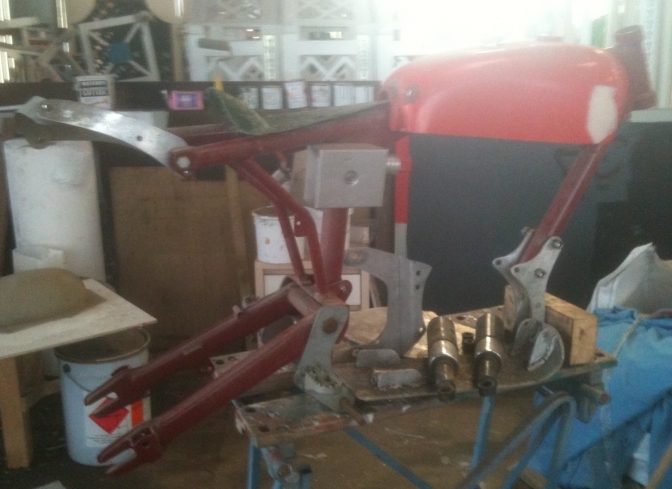 I will start with this abandoned "Triumph Cub Project". Dan Williams asked for information on frame mods to a standard frame so the photos of what I did to my frame was the best way to go. 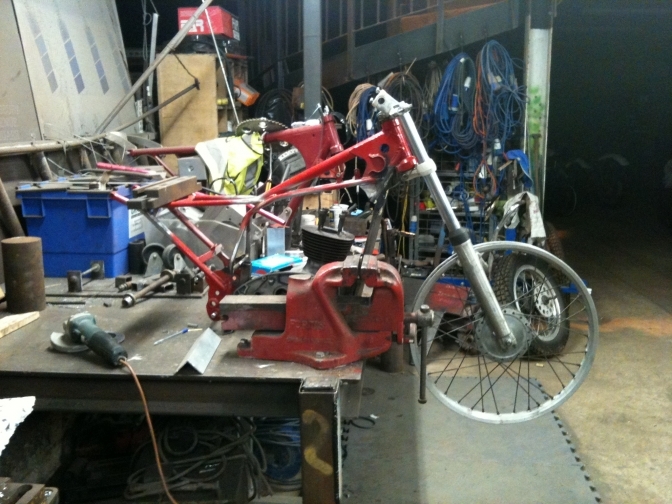 This is as far as I got with the project initualy, it then sat in a dirty corner of the workshop for years. 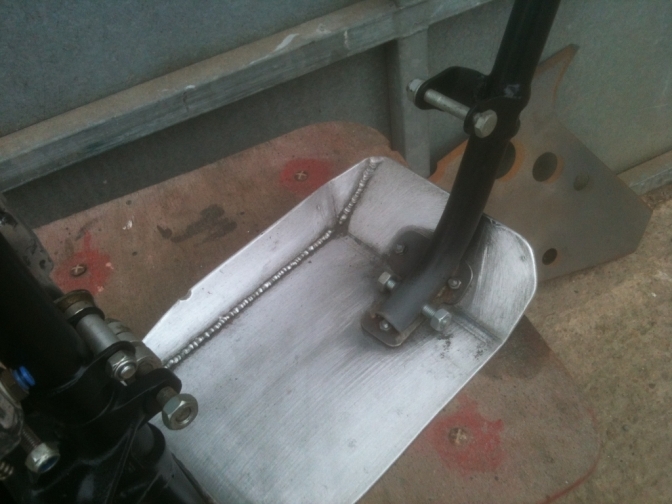 This shows the modifications to the bottom rail frame removal, and the replacement with the 5mm alloy bash-plate. the up-stands (there is another to be welded in on the right-hand side) help to put the rigidity back into this lower section of the frame. The bottom part of the frame was hacked off originally so that I could get the frame onto my jig to set a steering head angle for a New frame I was making. 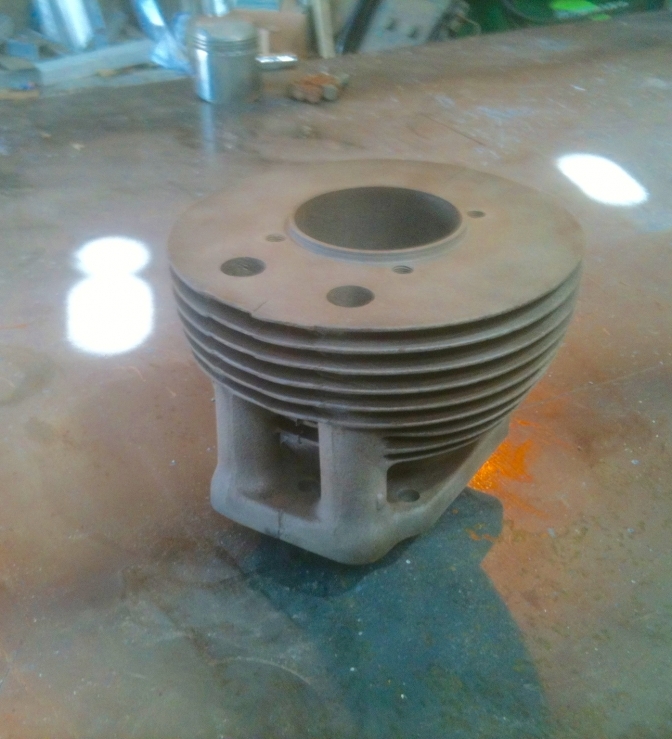 This is the oil tank I made on the same lines as the "One Trick Cub" from the USA. I liked that tank and just thought I would make one like it, one day when I was playing with the Tig welder we had on hire for a job. This is the tank replacement reinforcing now formed from the flat laser cut sheet in the first picture. I had to make tooling for my fly-press to achieve this. Same style as the "One Trick Cub" again and that is what inspired me to do the same, only the laser cutter would only do a batch of six to ten so I have a few spares. 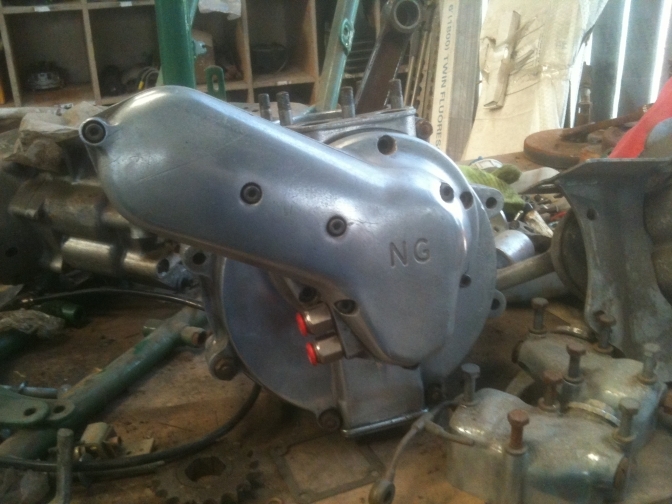 The swinging arm is a BSA Bantam D-B175 unit and probably needs No modification. 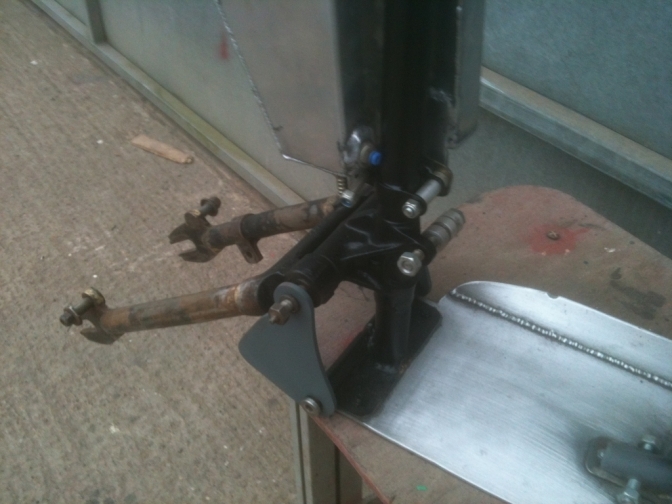 I was asked how to steepen the steering head angle well you could get out the gas bottles. But to be honest you would be wasting your time! By fitting longer rear shocks , or bringing down the rear shock mounts does that job for you. and without the hassle.of setting the frame up on a jig to check the uprightness of the steering head if you start to heat things up. (Sorry about the Ghosts on the door behind?) (gun needed washing out and I do like drawing things). When the engine is moved over. I need to now build the new subframe, as I must have used the one built on something else. The engine spacers are to move the motor over to the left. the front bracket was widened accordingly. I will try and find time this next week to fabricate the sub frame. Hope this helps so far Dan? OK Dan, I have looked at the down tube frame mod ,and think that the oil supply pipe would probably clear, then I checked the Faber frame , and decided to perform this mod below to the frame. Just to save action later ,if it did not clear. And it has tided up the chopped tube too. I am sure now that this should be OK. thanks Dan for spotting that. 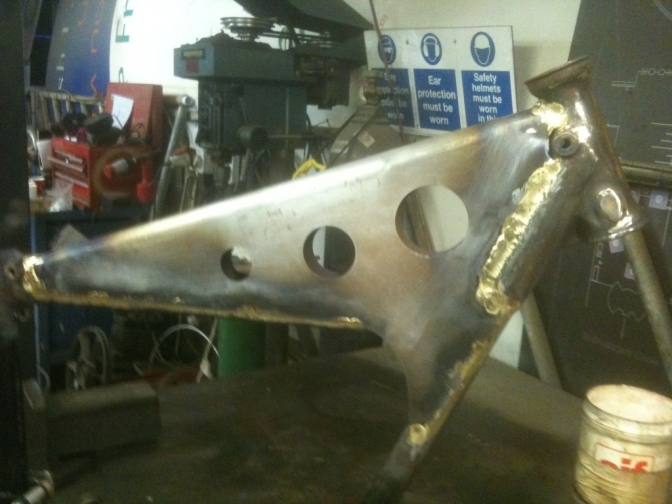 I have now bronze welded in the reinforcement. It is not that pretty around the head-stock casting ,but you need a load of heat to get this section hot enough. I now have to decide which head stock bearings to use. I am hoping I can find a set of taper bearings that will fit the bill. 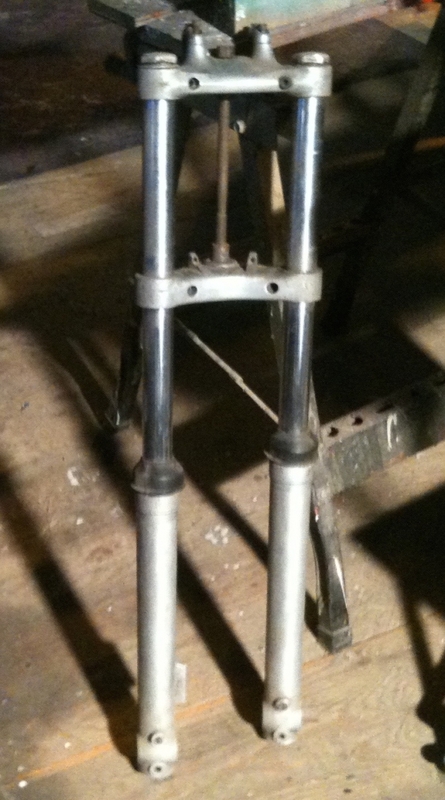 I have an old pair of Metal Profile forks that will do for the build and they have been laying about for years. and even a pair of Yamaha, now they could be better. I have now measured the MP forks and they are just too long at 33" and the gap between the yokes is 8", so you can see that if you have stuff laid about and have a choice, do your home work before jumping in at the deep end. Yes I could fit the MP forks, but three inches of the stanchions would have to be stuck out of the top yoke and in way of the handlebars. I could use the Honda 90 Cub wheel in the front, this also has been gathering dust since I removed it from a Cheney BSA many moons ago, this was the bike that Eric used has an hack to get about on so I was told. But I also have another Yamaha TY front wheel that is spare and would also fit the Ceriani or DT Yamaha forks better. There is a Cub rear hub knocking about or perhaps I will use a Jialing again. One of my Glass-Fibre tanks will do the job nicely and look the part on this frame that is what Ray Small designed it for, a Triumph Cub. There is a pair of Falcon shocks that I can strip and rebuild, that are the right size, I just need to make, or find a Triumph Cub sub frame. So all I want now is an engine. and a few more cycle parts. More Later it is only half way up the workshop and not to the back again yet,I just need that elusive motor to bring the bike back out to the front. Good Old Back Of The Shed. Back of the Shed Ariel Project. Waiting for BSA engine parts small,and had a enquiry about an Ariel frame, and this was just the spark I needed to have another go at the Ariels in the camp. So have decided to have another go at the 350 bike we started way back in 2008 I believe. 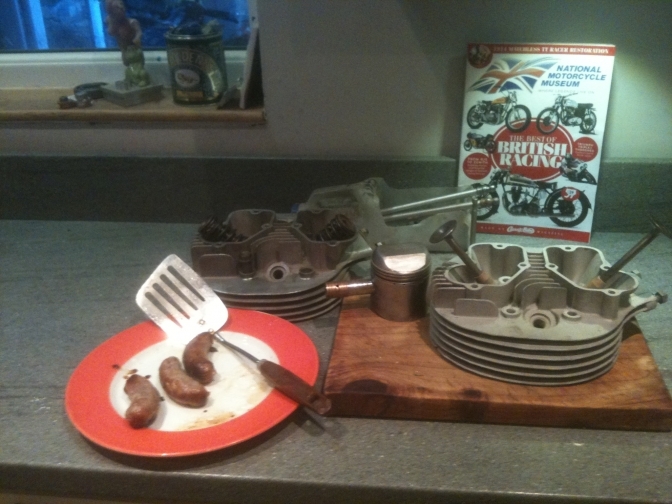 It all started with a ex 380 sprint engine that was acquired with a broken cam-follower, and fitted with a BSA piston. 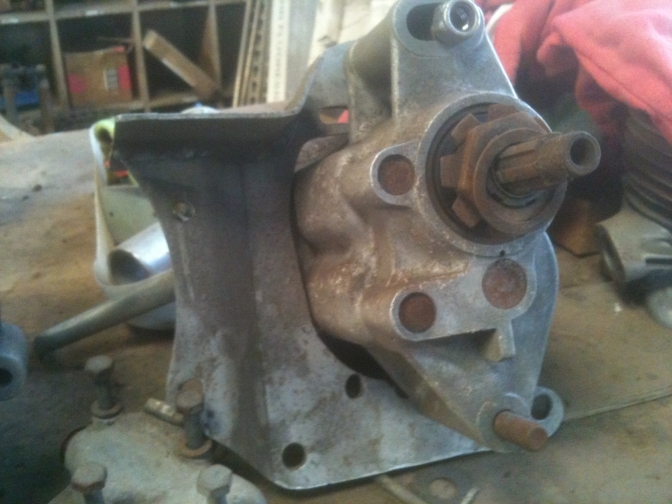 I started by stripping the engine, modifying and started to rebuild it along with a Burman gearbox. Then onto the market came a Bartram frame that was going to be replaced by a oil carrying version. by the "Dawson boys"Dave and father Pete. So the ex Andy Pitt frame and engine plates arrived and I sorted the footrests with new similar to what Dave and Pete had come up with on the new build. 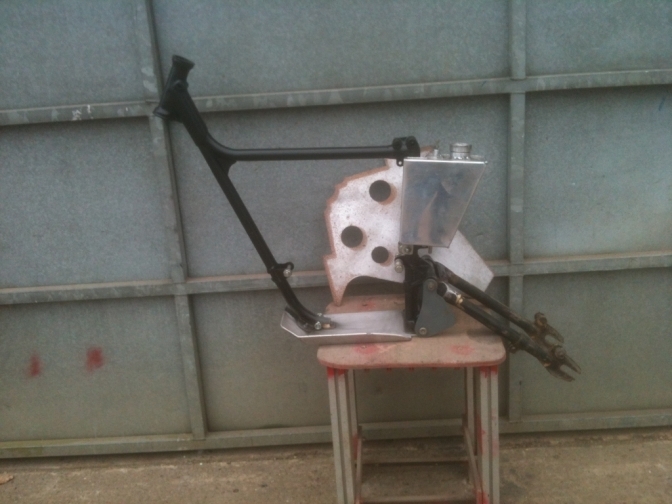 I modified a Ariel swinging arm to suit and checked the rest of the frame over before it went off to Redditch for a new coat of burgundy powder. 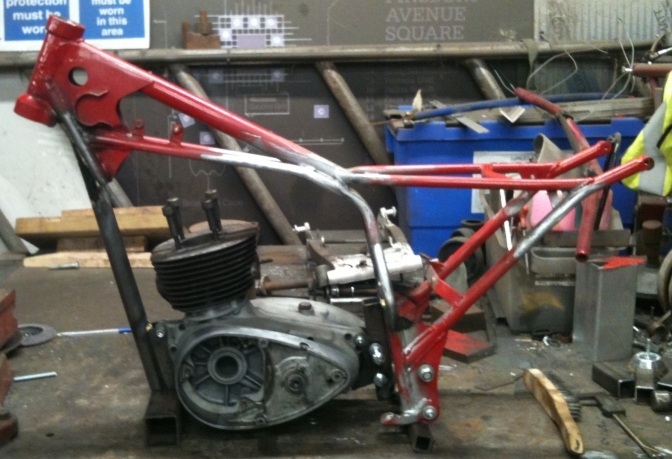 Here is the ex Andy Pitt Ariel before it got stripped out for the new frame and parts. So the parts for the engine were unearthed from under old sweatshirts that now had quite a considerable built up of dust on them from being stood so long. I had been moving the piston about in my stores at home for ages, and this is also where the soap-powder boxes contain the Ariel camshafts and the good followers that I have. so these were sorted out and earmarked for the build. A cut down milk-bottle at the workshop contained a couple of sets of valve springs and caps along with six sets of collets..But it turned out that the springs and caps were for the five hundred engine that was stripped out to use to make new foundry patterns of the cylinder had. But a search at home produced the two missing valve springs and the rest of the components. 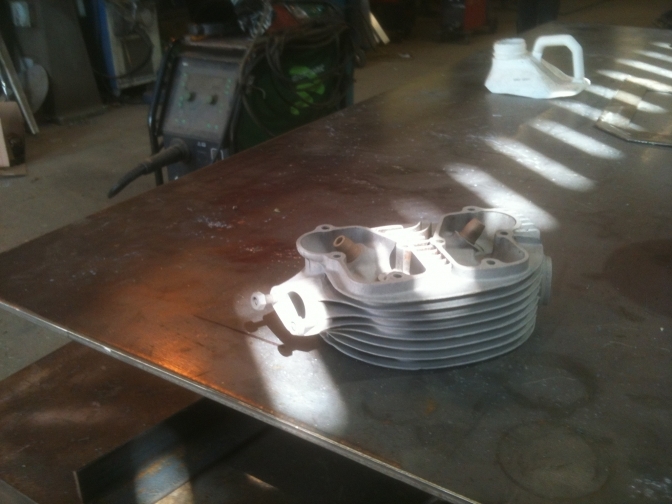 I then decided to order the missing collets for the five hundred, so I could also rebuild that cylinder head and refit to the bike used by Wright'y at the Classic Trials Show. 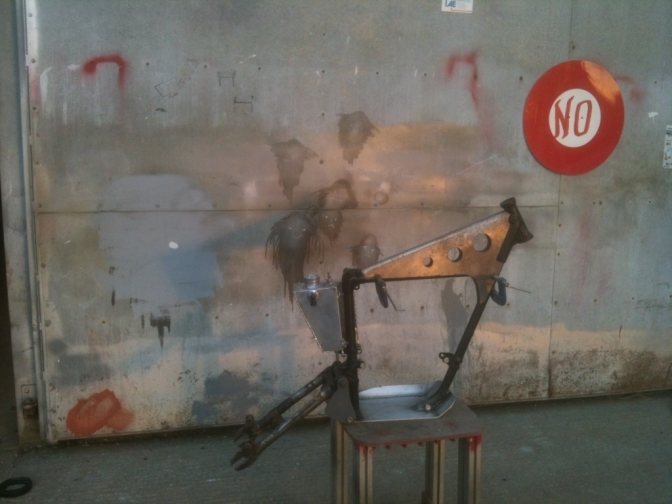 in 2010,the last time the bike was used.Two collets have come from Draganfly, but two are on backorder. nothing is easy is it. So I decided to stick with the steel barrel we have as if I mess thinking about getting a ally one the build will stall before it starts. So into the blast cabinet for a clean along with the 350 cylinder-head. and even the four head bolts. of the HT3. 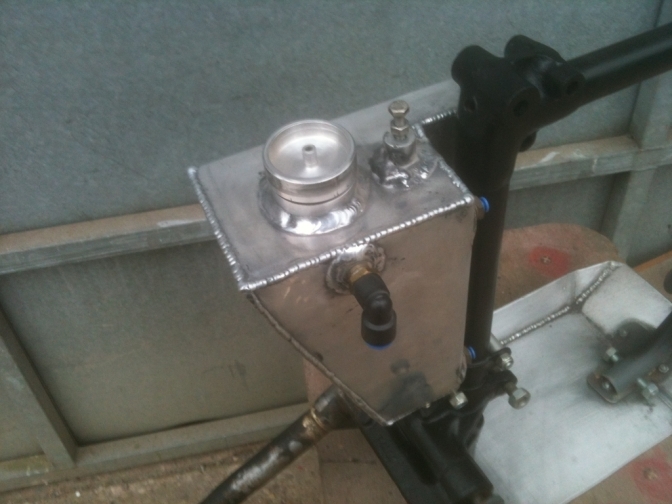 I quickly found most of the components I had readied way back in 2009.
modified rocker boxes, chain-case I had made, two seats one alloy one glass-fibre, gearbox and timing chest also modified with a bigger oil pump. I am still trying to remember what clutch I was going to use. I have a Jawa speedway unit but this was earmarked for the also long-time Noriel build. 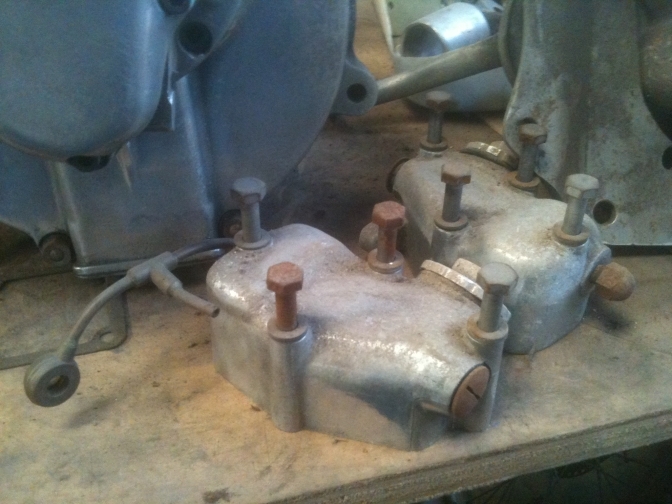 there is a couple of Yamaha clutches floating about. and I am not sure but think I may have been going to modify one of these. There is a lot of belt drive units floating about now-a-days too. The frame and plates ETC discarded by the Dawsons for there rebuild. (photo Courtesy of them too). Just pulled from a dusty corner, but the sun is shining on the project. And these were polished at the time. What clutch do I use? I have also found a clutch of magnetos a "Wader" as been selected for another Ariel out of the factory build, so I have the choice of a standard Lucas or a PAL and coil, think I will go with that for this build, and it has a wonderful big spark. So a start, more later. The Ariel frame is still on my workshop bench, and has been crying "Get Me Done" every time I look at it... the bearings for the engine I was short of have been in the box they came in on the same bench since the autumn. But the unexpected Mini-Otter Three, and then Four came along, and this put B.O.T.S projects back again. 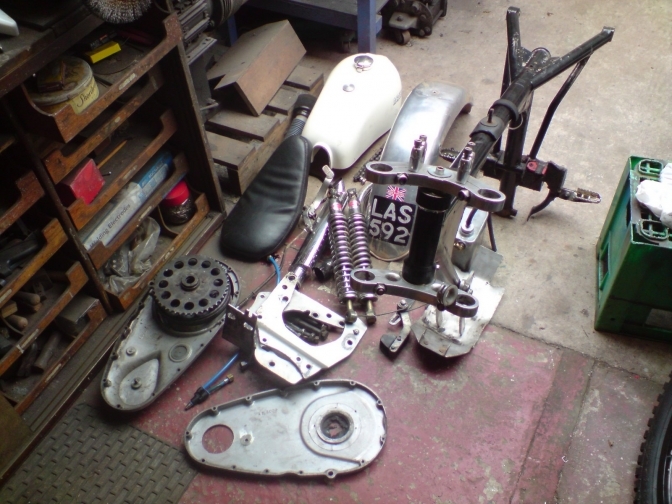 Then with Mini-Otter "Four" built up over the Christmas period, and waiting for number three frame, and the Otter-Cheaper frame, to come back from the powder coaters my mind drifted first onto the Honda TLR project, which is sort-of Back Of The Shed too. But I stumbled across a Photo of a Mist Green BSA Bantam. 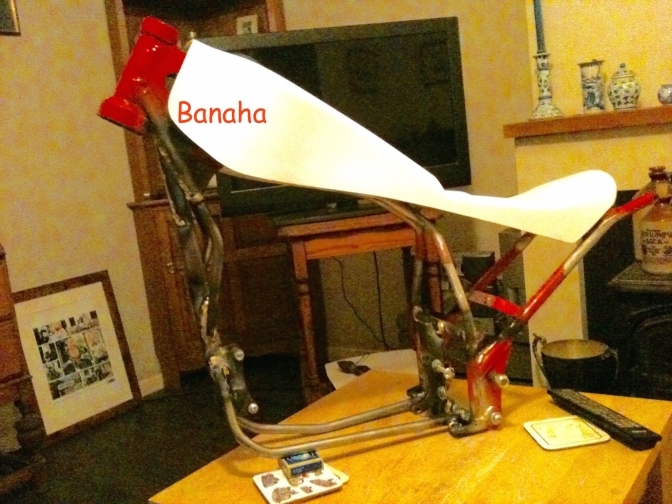 and it said Yamaha frame, I got interested,and thought I have that Mini-Majesty Godden built frame, that is "no more use or ornament", and stands me the cost of that and the glass-fibre tank-seat unit that I bought at the same time. So for the past three afternoons I have attacked the said frame with a four-inch angle grinder. Not a pretty sight,but I was on a mission to get my spare set of Bantam crankcases into that frame. 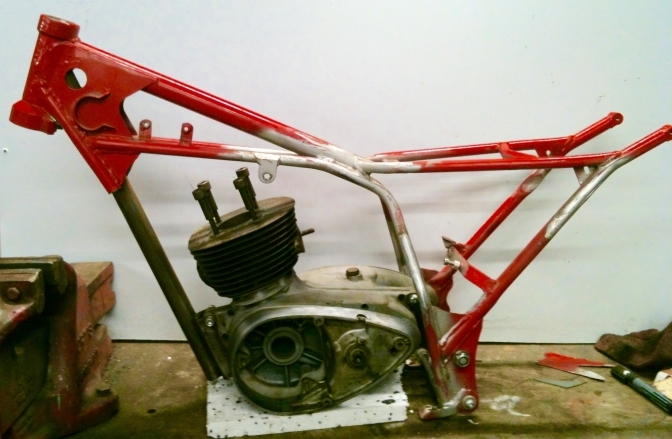 First Day I was reluctant to cut anything off except the unnecessary brackets that were added to fit the Honda Clone engine in, and this 250cc motor would just not fit, and I wasted 6 months trying to achieve that. Day two, and after studying the photos I had brought home, I could see the two small diameter front down tubes were going to have to go, and had to be replaced with a single down tube, because of the exhaust pipe outlet on the Bantam engine. So I cut a length of inch and a quarter round tube to about the right length, after checking on the IOM BSA Bantam, and tacked on the front Bantam engine mounting. I then tacked in a back small cross tube to replace the two I had chopped out the day before. 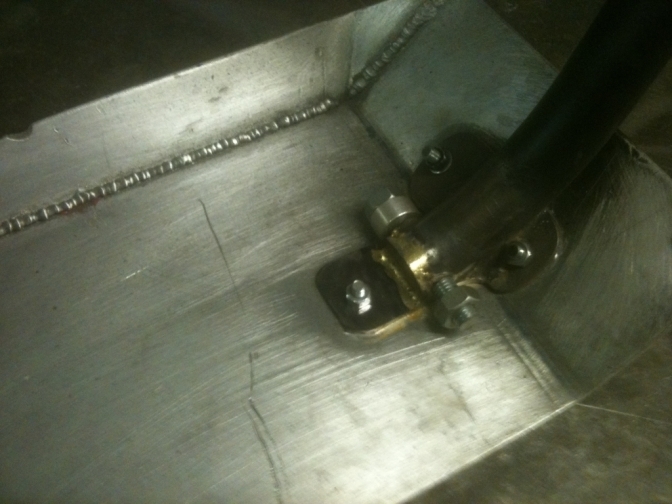 Then cut a suitable length of 30mm square tube to bolt the Bantam back mountings on ,this was then tacked into place. (If you look at the photo above you can see that the timing side timing cover is full length But the primary side one has been chopped off. And there is no photo of that side. It was my first thought to do this exercise, but after inspecting the situation it was going to complicate matters to much, has it would mean major reconstruction of the Bantam kick-start etc., so I would suffer with the long chain run like all Bantams, and just squeeze in the full length of the engine. I have to now rework the headstock area to my satisfaction. and fit under-run rails. Well I have given the frame a unique finish to the front down tube and it may set a trend as it has strengthened that weak area of a frame up considerably. I am naming it the Grapevine look..
We will see how well it steers Later..